Buried at RHEINBERG WAR CEMETERY, Germany, 10. B. 15. Aged 20. Son of Reginald and Grace Norton, of Brandon, Suffolk. Leslie was born on 14th February 1924, leading to his middle name being ‘Valentine’. 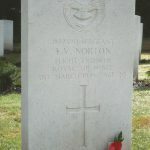 His parents were Reginald and Grace (nee Hyam) Norton. Leslie seems to have been part of a R.A.F. bomber crew flying out of Downham Market (635 squadron), which had only been created a few days prior. They were to be ‘pathfinders’, in Lancaster aircraft and leading out the allied bombers over the skies of Europe. Leslie’s aircraft took off from Downham Market just after 10pm on 30th March 1944, to lead out almost 800 R.A.F. bombers for a raid against Nuremburg, Germany. 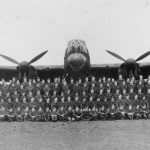 All did not go to plan – no one had predicted strong winds and a full moon with little cloud cover; and the aircraft suffered heavy losses (96 aircraft) as the enemy night fighters picked out the silhouetted bombers. It was recorded as one of the worst raids for the R.A.F. Leslie’s plane was one of those shot down by a German night fighter aircraft. According to Martin Bowman’s book, “Nuremburg, The Blackest Night In R.A.F. History…”, Leslie’s aircraft was shot down by Leutnant Hans Schäfer, and crashed 10km northwest of Giessen, killing everyone on board. He suggests this was likely to have been the crew’s twentieth operation. The crew were initially buried in Steinen Cemetery, but in 1947 were interred in the Rheinberg War Cemetery. Flight-Lieutenant, Hugh Julian Langdon Webb, pilot, (23) Beaconsfield, Bucks. 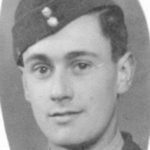 Flight-Sergeant, Leslie Valentine Norton, engineer (22) Brandon, Suffolk. Sergeant Clifford Edward Robert Fox, wireless operator/gunner, (22) Caister, Norfolk. Flying Officer Charles Edward Peake, navigator, (34) Freemantle, Southampton. Flying Officer James Puver, bomb aimer (?) Nottingham. Sergeant Edward Robert Reginald Moulding, mid/upper gunner, (20) Debden, Essex. Sergeant William Lindsay, tail gunner, (21) Dundee, Scotland.